As the year draws to a close, it becomes the time where we reflect on where we have come from, and where we are headed in the year to come. We make New Year’s resolutions, mostly of the personal type. We want to eat better, go to the gym more, and make time for activities that will develop ourselves and make us more well-rounded people. However, it is equally as important to be introspective in our professional lives as well – as a whole organization, in your smaller teams, and individually. One of the best ways to make sure everyone is on the same page is to have a meeting and discuss your resolutions for the new year. A perfect way to let everybody know about your meeting is to use our Nimble Group Message feature! If all of your team members are contacts in Nimble, you can send a personalized message to everyone, getting the message out there! Make sure to give your team plenty of notice for this meeting! Be sure to include all details: When, Where, and Why you are meeting. Additionally, think about providing good snacks, and making sure beverages such as water, coffee, and tea are accessible! Everyone loves to be fed, and it shows that you care about their comfort during a meeting that may ask some to come further out of their shell than they are used to. Another important variable is the setting for this meeting. Choosing a large enough room is important, and it should be free from nearby loud noises that may be distracting. If you are a member of a very large organization, it may be difficult to get everybody in one room at the same time, and if this is the case it may be best to just meet with your team and discuss ways you can positively impact the company as a whole. On the day of the meeting, make sure you have enough chairs, and that all necessary materials are present in the workspace you have chosen. This includes large paper, small Post-it notes, markers and pens, and a working projector if you will be utilizing electronic note taking. You might consider setting up a Google Doc that you will send to all of your team members after the meeting. After your team members arrive and have settled in, it’s time to begin! Break the ice by thanking everyone for coming, highlighting some key areas of success throughout the year, and inviting everyone in the room to contribute. Beginning by sharing successes is a great way to ensure a positive tone throughout the meeting, as it emphasizes your team’s camaraderie. How can we contribute to the organization’s “big picture” growth? What does success look like for our team over the course of the next year? If your team is comfortable, you might even break it down further and discuss personal professional goals! There are many ways to gain feedback for different group dynamics. You could go around the room and have everyone say something, even if they agree with what another person has already suggested. Shared goals are important, and more agreements may mean that particular resolution should be high priority! You might have everyone write their suggestions down on a Post-it and put it in a box, which you mix up and read aloud, so that it is a more anonymous experience. If your team is comprised of smaller, specialized initiatives, it may be appropriate to take some time for a breakout session where initiative members flesh out their goals as well. Make sure your resolutions are recorded in such a way that they are shareable! If you choose to write them down on paper, utilize large sheets that can be posted in a common area so that everyone can see and reflect on them periodically. If your organization is using Google Apps, creating a Google Doc that is shared with the team is another great way to ensure your team members have access to all you have discussed. For personal resolutions, keeping a Post-it note at your station in a place where you will see it every day may be effective. After the meeting, it’s important to follow up on the resolutions that your team has come up with and gauge progress! All too often, New Year’s resolutions are made and quickly forgotten about. Be sure to revisit them periodically in meetings, and communicate when goals are met! Just like you sent the announcement for the initial meeting via Nimble’s Group Messaging feature, you might send a group message to your team once a month or so to reflect on current progress or celebrate achievements. 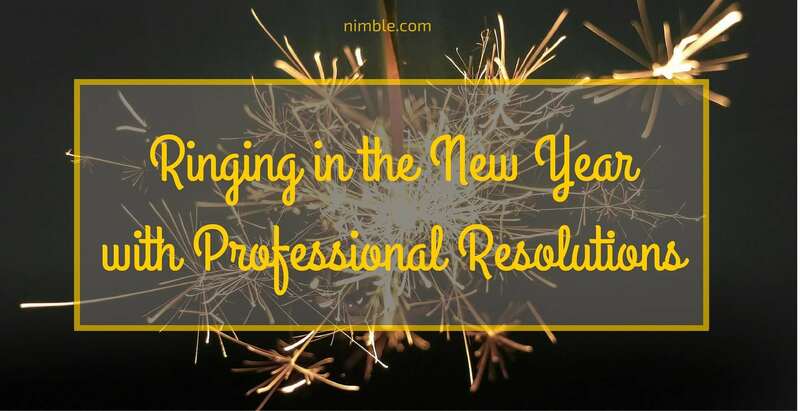 If your team is in Nimble, you may assign tasks to one another to help accomplish multi-step resolutions! Once a task is created, the person it is assigned to can send it to someone else, and even add comments as it is passed along. For more personal resolutions, such as learning more about a specialty you are interested in, or even being more vocal in team meetings, the best resource is the people around you! This could be someone who is successful in the specialty you are considering, or a team member who is always fully engaged during meetings. Setting aside time to meet with these appointed mentors periodically will allow you to gain valuable insight and tools to move forward professionally. Additionally, it helps to feel that you are not alone, and that there is someone there to encourage you and help you stay accountable. Lastly, it is very important to reflect on your own. Even if you did not share personal resolutions during the team meeting, taking a short break once in a while at work to reflect on any that you thought of for yourself will keep you on track for a year of growth. Perhaps this involves finding a quiet room at work to sit down with your laptop or paper and pen, taking a walk, or even just plugging in some headphones at your station and writing some goals and accomplishments on a Post-it where you will see them every day! This way, come next December you will be able to see where you came from, and how you have developed professionally. Previous How Has Social Selling and Sales Evolved in The Past 12 Months?